Photo of Avraham Stern (1907-1942), leder of the extremist zionist organisation Lehi and former member of the direction of Irgun. In a deal worked out with the Reich Economics Ministry, the blocked German bank accounts of prospective immigrants would be unblocked and funds from them used by Hanotea [a Palestinian Jewish farming company] to buy agricultural German goods; these goods, along with the immigrants, would then be shipped to Palestine, and the immigrants would be granted a house or citrus plantation by the company to the same value. But what is far less well-known is the level of collaboration between these same two political movements and Stalin’s Russia. The Daily Beast published an account of Russian penetration of the Zionist movement, and the role UK spy, Kim Philby played in sabotaging the British Mandate in Palestine. What especially caught my eye was the extent of Russian penetration of the far-right Zionist movement in the years just before and proceeding Israeli independence. The goal of Russian intelligence during that period was to frustrate the designs of the declining British empire. This was the played out in the larger context of a budding Cold War, in which both Britain and the U.S. were seen as Soviet Russia’s arch enemies. 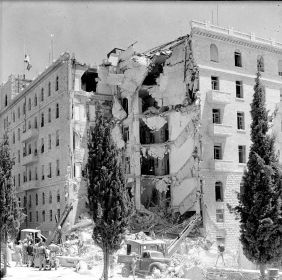 Results of Lehi bombing of King David Hotel, which killed nearly 100 Britons, Arabs and Jews, including Holocaust survivors. Therefore, whatever Stalin and his agents could do to bring Britain to its knees benefited Russian interests. This included, according to the Daily Beast, cultivation and recruitment of Zionist Revisionists from eastern Europe and Russia who eventually made aliyah to Palestine. Once there, they joined Lehi and the Irgun, the two far-right political movements, both of which employed extreme violence (bombings, massacres, assassinations, etc.) to further their political aims. For starters, many of the operatives hailed originally from what would was, by 1946, Soviet or Soviet-dominated territory behind the Iron Curtain. A top secret memo prepared by British spies described Lehi as being dominated by Eastern Bloc émigrés. “Most of the members were Jews of Polish, Russian and Bulgarian origin,” the MI5 analysts concluded. Lehi and the Irgun had networks all over the Middle East, Europe, and the United States. Lehi and the Irgun, as noted, based their European networks out of Paris, where both groups were led by men born inside the USSR itself. …With so many actors from the Soviet Union, it’s hardly surprising that British and American intelligence agencies suspected that there were Communist links to the terror groups. Menachem Begin came to the Middle East via a [this] route, arriving on Palestinian soil after being allowed to escape one of Stalin’s gulags. The Polish émigré grew up in Belarus in the Soviet Union before he was rounded up by the NKVD as a Zionist during the war. He was convicted of sedition without trial and condemned to eight years in the gulag. After a deal with the Polish government in exile following the collapse of the Nazi-Soviet pact in 1940, he was allowed to join the Polish Armed Forces in the East, which was created in the USSR and funded by Moscow. 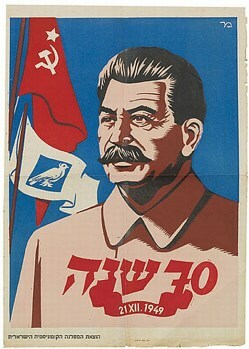 Stalin agreed to allow the army, which contained an estimated 4,000 Polish Jews, to march down through Persia to Palestine. Once in the Middle East, Begin was discharged by the Polish Army and soon rose to the top of the Irgun. His Polish compatriot Nathan Yellin-Friedman also escaped from the Russians only to surface in Palestine where he became one of the leaders of Lehi. Yellin-Friedman, like [Yitzhak] Shamir, was personally involved in plotting the assassination of Lord Moyne. Despite the speculation, Britain never publicly accused the Soviets and their allies of sending Zionist leaders or trained fighters to disrupt the British mandate in Palestine. But newly declassified intelligence reports show that MI5 believed it had enough evidence to prove that the Polish Army, which was formed in the Soviet Union but was mainly staffed by anti-Communists from the old Polish forces, was doing more than turning a blind eye to illicit Zionist travelers—it was secretly working to help establish a terror group that would undermine the British. Nathan Friedman-Yellin was one of the first Zionist leaders to recognize that coming battle between East and West, according to Joseph Heller, one of the most respected Israeli scholars on the history of the Jewish underground. As one of Lehi’s leaders, Friedman-Yellin first began thinking about—and tentatively advocating for—the possibility that the USSR would become a serious sponsor of Lehi’s paramilitary aims in 1943. This was a remarkable prospect given the history of the Zionist militant groups which had formed out of the right-wing Revisionist movement in Poland. The politics of Lehi’s founder, Avraham Stern, unquestionably belonged to the extreme right-wing. Indeed, he even offered to coöperate with the Nazis and Italian dictator Benito Mussolini, whose troops were advancing through Egypt in 1940. He made the extraordinary calculation that his enemy’s enemies should be his friends—despite the anti-Semitic atrocities being carried out under the orders of Adolf Hitler. Another recently declassified intelligence agency dossier, included a telegram that quoted secretly printed Lehi pamphlets from 1947 calling for “a re-orientation of Zionist policy to bring it into line with Russian aims against British imperialism.” A telegram from the file…reported a growing co-operation between the local Communists and the Zionist extremists. Extraordinarily, both poles of the Zionist movement, the left and even the terrorist right, could move quickly from pursuing alliances with the Nazis, who exterminated 6-million Jews, to Stalin, who had by then conducted the 1930s purges, which saw the execution of thousands (many of them Jews), and starved 20-million kulak peasants. It’s remarkable that Lehi could propose establishing a “totalitarian” Nazi satellite state in the Middle East in one breath; and in the next, ally itself with Communist Russia. At best, it shows an incredible level of “flexibility;” at worst, it represents a total betrayal of any sense of first principles or moral values. One might argue that any political movement has an obligation to ensure its survival, and if it must dance with the devil to do so–then so be it. But the problem is when such alliances betray the very values and individuals your movement purports to represent, then they become debilitating and even shameful. Ben Gurion himself was the same sort of Machiavellian figure, who infamously said if given a choice of saving all European Jewry and seeing them go to America; or only saving half and having them emigrate to Palestine–he’d choose the latter. So profound cynicism and exploitative political machinations were common to both Zionist camps. Perhaps the most damaging aspect of this cynical approach to nation-building is that Israel, from even before its inception, developed an international reputation of amorality. Unlike American foreign policy, which has espoused (sometimes fitfully) our traditions of democracy, tolerance and the rule of law, Israel has employed the tactics of bartering and bribery to advance its interests. This continues to this very day. Israeli foreign and security policy is dirty and caters to the larcenous instincts of some of the most unsavory leaders on the planet. Another factor in this history is its legacy for Israel’s current far-right ruling regime. The ruling Likud Party finds its political antecedents in the very Lehi terrorists who made common cause first with Hitler and then with Stalin. No one should be surprised to find this is the very same party which makes common cause with Jewish settler terror; and is prepared to jettison democracy in order to become an apartheid state. Zionist Revisionism has always been a movement of slippery, chameleon-like ideology. It has never been wed to the values inscribed by Ben Gurion in the state’s Declaration of Independence. That’s why Bibi Netanyahu can heartily endorse a proposed revision to Israeli Basic Law, which supporters call the ‘nation-state law.’ It is nothing of the sort. It should be called the ‘apartheid law’: it would deny Palestinians citizens the right to see their own country as an expression of their rights to national self-determination. Among other nuggets: it would strip Arabic as a national language and legalize the exclusion of Palestinian Israelis from Jewish-only settlements and housing. It should come as little surprise that a movement that can seek common cause with two mass murderers should jettison whatever values the State once held dear in order to create a ethnically-pure Jewish state. This is not only apartheid. It is worse. It smacks of Hitler’s Nuremberg Laws, whose goal was eventually to eradicate Jews from German life. You don’t have to ask which ethnic group the Likud is seeking to eliminate from Israeli life.